Eating a diverse diet is an internationally accepted recommendation for a healthy diet. The food-based dietary guideline (FBDG) “Enjoy a variety of foods” aims to encourage people to consume mixed meals, to increase variety by eating different foods from various food groups, and to alter food preparation methods. This position paper suggests ways of measuring dietary variety, addresses the consequences of poor dietary variety in South Africa, and provides results pertaining to dietary variety in South African children and adults. The literature reveals that dietary diversity is best calculated by means of different food groups, which are based on the traditional eating patterns of the population under investigation. Ideally, the recall period should be three days. Two national surveys in South Africa have provided data on dietary diversity scores (DDS) in adults and children, of 4.02 and 3.6 respectively. It was shown that in children, DDS positively relates to weight-for-height z-scores, with a z-score above zero being achieved when DDS is > 4. However, an energy-dense diet is cheaper and lower in micronutrients and also positively associated with increased body mass index in women. Hence, dietary variety is essential in improving the micronutrient intake of the diet, and is also important in preventing obesity. Household food insecurity in South Africa remains a constraint on the implementation of this guideline. 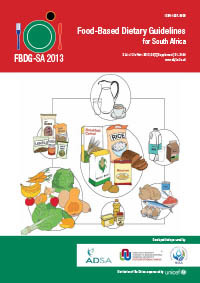 This FBDG should be used in conjunction with the other South African FBDGs, to ensure the sufficient intake of food that contains protective factors and the limited intake of food that is known to increase the risk of noncommunicable diseases.